Sometimes "ordinary" just isn't enough. The toughest projects call for a machine with incredible power and capability. Enter the 2019 Ford Super Duty F-250 and F-350. These beasts have the brawn and sheer strength to tackle any challenge you might have. From hauling heavy payloads to towing massive equipment, these trucks are essential to getting the job done. With that said, which model is the right option for you? While the two trucks have a lot to offer, both are very different. Here we have put the 2019 Ford Super Duty F-250 and F-350 side-by-side to best show the unique capabilities of each model. 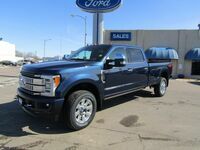 Explore the 2019 Ford Super Duty F-250 and F-350 at Wolf Auto Center today! 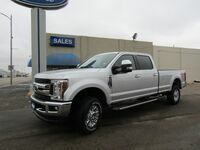 Choosing between the F-250 and F-350 comes down to deciding what is most important to you in a truck. Perhaps that is a specific amount of towing and hauling power or maybe it's also about what high-tech features are standard. Both pickup trucks are available with diesel engine options and the choice of crew, super and regular cab styles. For 2019, the F-250 and F-350 receive a new Lariat Sport Package and a new B&O Play stereo. With that said, the most significant differences between the 2019 Ford Super Duty F-250 and F-350 are the engine choices and subsequent capabilities of each model. Which truck is the right option for you? Our team of experts know these trucks inside and out and can help you compare specs and features to find the best model for you. Contact our award-winning team today!